If you’re tired of playing the latest online slots that are packed with bonus features and simply want to spin the reels quickly you can’t go wrong with the Ultimate Hot slot machine from EGT. It’s the ‘crème de la crème’ of their range of ‘hot’ slots following on from Supreme Hot, 5 Dazzling Hot, Burning Hot and several others, but will it really prove to be the very hottest slot of them all? 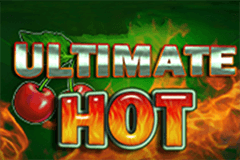 Ultimate Hot is played across an emerald green background with the reels quickly heating up as a variety of famous retro (7’s, stars, and bells) and fruity (watermelon, grapes, plums, lemons, oranges, and cherries) symbols fall - only for them to erupt into a burst of flames. Things also heat up if you opt to risk your winnings in the gamble mode where you could double up or lose everything, plus the suits above the reels represent the values of the jackpots that can be won in the random Jackpot Cards feature – will you go on a hot streak and scoop the ultimate Spade jackpot? The Ultimate Hot slot machine from EGT is played across 3x3 reels meaning that there is a total of nine symbols on screen and winning combinations can be formed across 5 fixed paylines, with wins paying from left to right on adjacent reels. There is also a very high RTP of 95.51% which we have become accustomed to from EGT slots, plus it won’t break the bank as you can choose from five different betting options - 5, 10, 25, 50 or 100! There are no special symbols like Wilds or Scatters on the reels of Ultimate Hot due to its simplicity and EGT keeping this to the bare minimum to entice the old-school players amongst you. Instead it is simply a mixture of retro and fruit symbols that you’ll be all too familiar with if you’ve played online fruit machines before – with nine different symbols in total. The symbol offering the highest payout of all is the 7’s which pay 60x your stake for three on a payline, while stars are the second most valuable paying 40x. If you land three juicy watermelons you’ll be enjoying a delicious 20x win, while grapes and bells both pay out 16x your stake, and plumbs, oranges, lemons and cherries are all worth 8x your stake for three on a payline. You won’t be spinning the reels for free or watching any quirky animated scenes playing the Ultimate Hot as there is no free spins mode or second screen bonus round, however there is a gamble mode and the Jackpot Cards feature which are both firm fixtures in all online slots from EGT. If you’ve played online slots before you’ll be familiar with the gamble feature which offers you the opportunity to double your winnings, however they must be worth less than 35x your stake. You simply need to click on the red or black button and hope that the playing card stops on that colour when you press the button. If it does you double your winnings, but if there is no match your winnings sizzle and go up in smoke! The Jackpot Cards feature actually triggers completely at random and when it does you’ll be presented with a grid of twelve face-down playing cards. You then need to pick cards to reveal their suit and once you match three of them you win that corresponding jackpot – with the club jackpot being the smallest followed by the diamond jackpot, the heart jackpot, and the spade jackpot proving to be the ultimate to win! Despite having ‘ultimate’ in its title, the Ultimate Hot slot machine is nothing we haven’t encountered before. It has a very basic structure of 3 reels and 5 fixed paylines which will appeal to those of you who enjoy retro slots, the symbols are same ones we see over and over again, and it only offers the gamble mode and Jackpot Cards feature which are in every slot developed by EGT. Personally I prefer the Flaming Hot slot machine which features a Wild and Scatter symbol for bigger wins.